In the early days of Thai restaurants in Tacoma, my requests were denied. Now, I haven't been refused for more than a year. Perhaps Thai cooks have been worn down by the American palate. I like Pad Thai. I order it with pork and tofu. It's that combination that resulted in weird looks and refusals. 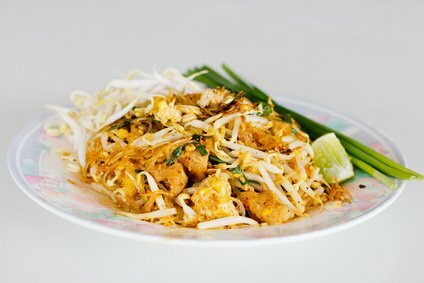 Pad Thai is a national dish from Thailand, which is a little strange because it actually began in Vietnam as stir-fry pho noodles. I like the texture of the noodles combined with the silkiness of the soy along with the chewiness of the pork. Originally, tofu here in America was considered a meat substitute, but that does tofu an injustice. In comparing fried tofu to bacon, it's always going to lose. But as its own flavor profile I like it, but just like any other food, it all depends on how it is cooked and who does the cooking. Like mushrooms tofu soaks up other flavors. 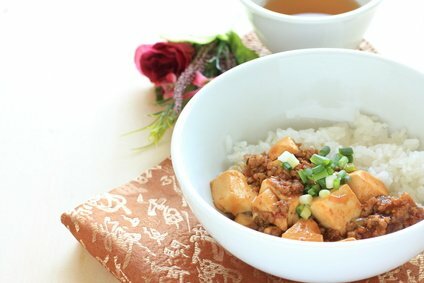 Tofu originated in China over two thousand years ago. Just like farmers made cheese from milk curds, soy bean farmers made tofu from soy juice. Tofu is a major ingredient in many East Asian cuisines. Soy is a superfood. The benefits of soy go on and on. Tofu is low in calories and relatively high in protein. Introducing soy into the American diet is good for both men and women. It's a godsend for those who are lactose intolerant. Vanilla flavored soy milk with chocolate chip cookies anyone? Writing about "Dietary influences on DNA integrity and prostate cancer prevention" Emily Ho, Ph.D. and Principal Investigator for the Linus Pauling Institute says, "Prostate cancer is the most common cancer in American men, accounting for 33% of male cancer cases in 2005. Factors influencing prostate cancer risk include age, race, family history, hormone levels, chronic inflammation, and diet. Of these factors, we may be able to influence inflammation, and we can definitely influence our diet. The U.S. has the highest rate of prostate cancer in the world, and Asian countries have the lowest. However, migration studies show that Asian men who have moved to the U.S. have a much higher rate of prostate cancer, suggesting that lifestyle factors, such as diet, play a significant role in development of prostate cancer (and not just genetics). She connects the dots for Asian and American soy usage by adding, "High soy and tea intake may, in part, explain the lower prostate cancer risk in men living in Asian countries where soy and tea are commonly consumed." She goes on to explain that the whole food approach is what is effective and the combination of soy and tea is what makes the diet so effective. 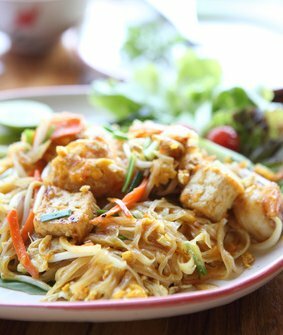 In other words, when you are asked if you would like tea with your Pad Thai and tofu, the correct response is "Yes, please." The magic potion of soy is Soy Isoflavones. LPI studies reveal, "Isoflavones are a class of phytoestrogens-plant-derived compounds with estrogenic activity. Soybeans and soy products are the richest sources of isoflavones in the human diet." They also show that, "Consumption of soy isoflavones, at doses of 90 mg/day, may inhibit bone resorption and stimulate bone formation," and in addition "Overall, the results of numerous observational studies do not support the idea that high soy isoflavone intakes in adults are protective against breast cancer. Limited research suggests that higher intakes of soy foods early in life may decrease the risk of breast cancer in adulthood." We need to begin consumption of soy much earlier than an adults late nite dinner at a Thai restaurant. Not interested in Pad Thai for your soy or tofu? Try making a cashew and cardamon fudge with tofu or incorporating tofu and raw egg into your next meatloaf. 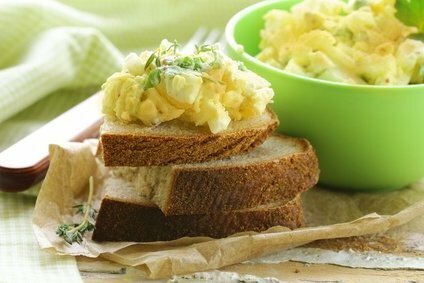 I think the most appealing recipe I've seen is a faux egg salad sandwich. I hate the idea of substituting tofu for anything, but I think this idea stands on its own. You simply mash firm cubes of tofu, sprinkle it with turmeric (another superfood), add a little soy sauce, a little fat-free mayo, and some minced bread and butter pickles. Salt and pepper to taste. Leave it in the fridge for fifteen minutes. Let the tofu absorb all the flavors. Add in basil, rosemary, and fresh spinach leaves. Then spread the mixture on whole grain bread (like that baked by Roman Meal). Serve with a pumpkin soup and green tea and you have a superfood meal. Oh, Soy Can You See? 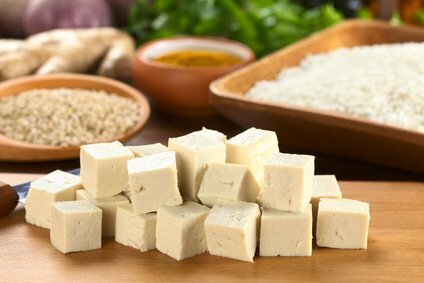 Tofu in America, Nutritional Benefits of Soy and Tofu, Nutritional Benefits of Soy, Nutritional Benefits of Tofu, free nutrition content article, Healthy Aging Article, Healthy Living Article.